Carol Peters, founding member of the Literary Goddesses of Mendham, joins us to discuss her book club, that met through the local library and enjoys a wide range of books and activities together. BookBrowse interviews Carol Peters, founding member of the Literary Goddesses of Mendham, joins us to discuss her book club, that met through the local library and enjoys a wide range of books and activities together. about all aspects of their book club. Hello Carol, thanks for joining us. Please tell us a bit about your book club. Our group started about two and a half years ago. I met with our local library staff and friends (Mendham Borough Library, Mendham, NJ) to determine if there was any interest in an evening book club. The library sponsored a morning book club but as I worked full time I was interested in an evening club. An Evening Book Club was started which would meet once a month and the information explaining dates and times was published in the library newsletter. There are usually 6 at our meetings. Our ages range from mid 40's to mid 50's, including a teacher, realtor, pharmaceutical researcher and business women. We all love to read, travel, enjoy our family time and partner with each other on work related opportunities or issues. 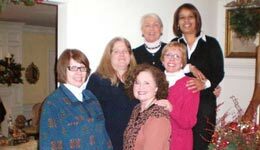 Clockwise from left are Tally, Lee Ann, Jane, Debbie, Carol (cranberry colored sweater and glasses), and Kathleen (host). How did you come up with your name, Literary Goddesses of Mendham? We just recently decided upon this name after parlaying the name of a "Goddess" salad dressing with our literary endeavors! We certainly all have a laugh at ourselves when reflecting upon our group name! We love our association and friendship. With the exception of one member who I knew from work before we started the Club, our group friendship is a result of our meeting through the Club. Our personalities blend and we do have fun at our meetings. I believe an important dynamic for our Club is our interest in reading any book selection identified as a choice by a member. We tend to read fiction, classics, historical fiction, and books on women's issues. Club members either e-mail each other or at meetings we discuss the proposed selections and choose. We are very open to anyone's selection. Do you tend to read hardcovers or paperbacks, and do you usually buy or borrow books? We don't have a preference between hardcovers and paperbacks. Sometimes we buy books, sometimes we borrow through an arrangement with the library? In most cases our selection is the priority so if it is a recent book we buy it and if it is a classic or older selection we use our local library. Does the availability of a reading guide effect your book choices? When available, we use reading guides to focus the discussion and oftentimes new questions arise based on the guide. We use the reading guide as a template for a discussion but we've had books without a reading guide and developed our own questions based on other resources. One example was The River of Doubt by Candice Millard. There was no reading guide but she had been interviewed on NPR and our discussion leader developed questions from the interview. What types of books do you find make for good discussions in your group; are there any that haven't worked? The books that generated the best discussions have been those with controversial topics or strong characters with major personality flaws, or women's issue books such as The Feminine Mistake by Leslie Bennetts and A Year by the Sea by Joan Anderson. Both were interesting observations of women's lives and generated great discussions. What are some of the books that have generated the most interesting discussions and would you say that these are also your favorite books? The last 5 have been some of our particular favorites. We meet every month except August, either at each other's homes or at a restaurant. Our meetings run for about 3 hours. We generally catch up on anything new in our lives and then begin our discussions. We follow a general structure: Dinner, discussion, dessert, new book selections, leaders and locations. Generally whoever chooses the book selection is the leader of the discussion. We communicate via email. I manage the e-mails and group updates. I generally recap the meeting, update the calendar and list potential book selections and other activities. For example, we all love Jane Austen so recently I've been sending emails about the PBS masterpiece theater Jane Austen collection and movie dates. I will also discuss other activities members may be interested in, such as the recent John Adams mini series on HBO and The Other Boleyn Girl movie event. Having our meetings at each other's home, sharing recipes, meeting at a restaurant, sharing holidays and celebrating birthdays together are our favorite things. Wow! It sounds like you've got a lot going on - can you share some specific events/activities? We're planning a trip to Charleston, South Carolina in the Fall for a visit and book discussion with a member who recently moved, and also looking at doing a walking tour together in NYC and going to a play together. Our May meeting will include a 100th birthday celebration of one of our member's Great Aunt in addition to our book discussion. We have a summer barbeque in July and a Christmas Holiday Party/Gift Exchange in December. It's interesting that although you met through the library, you don't now meet in the library. Was that a conscious decision or just how it happened, perhaps because you were meeting in the evenings? Also, I assume the group started out as open to men and women, but has turned out to be all women. Would you be open to men joining at this point? If so, do you think it would change the dynamics? After several meetings at the Library where we had started bringing dinner, one member Tally decided to host at her home. It was great to relax and have dinner in a very comfortable and gracious surrounding. We still copy our local library team with our upcoming schedule. In respect to men joining the Club, any man interested in joining the "Goddesses" and our dynamic discussions would be welcome. Have you ever had authors visit with your book club – either in person or by phone? We have had two author call-ins. The first was Jason Roberts who wrote A Sense of the World: How a Blind Man Became History's Greatest Traveler. I had e-mailed Jason to ask about a reading guide and he e-mailed me back and was interested in a phone interview. The discussion leader had prepared questions and we asked our local library book club to join us. I also contacted Jeff Shaara and set up a phone interview for his latest book The Rising Tide: A novel of World War II. I led the discussion and Jeff could not have been more interesting and a pleasure to talk with. Jeff Shaara's father Michael wrote Killer Angels which won a Pulitzer Prize in 1975 and was the impetus for the movie "Gettysburg". Jeff has followed in his father's footsteps and has written additional novels about the Civil War, Revolutionary War, World War I and now World War II. In June we are hosting John Shors for an author chat who I contacted through Bookbrowse. His book Beneath a Marble Sky is about the building of the Taj Mahal and looks very interesting. You seem to have become a remarkably cohesive group in a relatively short amount of time, especially as you were mostly not acquainted beforehand, and it certainly sounds like you have a lot of fun and keep things interesting. What hints would you offer a group who are just getting started or who are feeling little stale and want to freshen things up? The success of our Club is a result of ensuring everyone participates and has a voice. Our group takes time to listen to each other's opinions and point of view. We have all become great friends and value our time together. I also would advocate changing locations for your meetings, making sure the book selections are varied, and having annual events to vary the meeting dynamic. My next challenge is to have an author visit in person! Thank you Carol, you've certainly given us a lot to think about! I'm sure I speak for everyone in wishing you and The Literary Goddesses many more happy years together.